Today’s customers demand engaging visual content whenever they interact with brands—whether these experiences happen through traditional media such as billboards and catalogs or through mobile apps and websites. Without the right assets, delivered in the right ways, companies can’t enable the meaningful, personalized customer interactions pivotal to success. 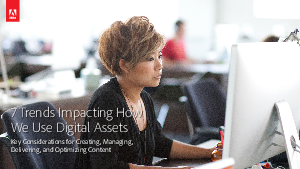 Managing content versions, approvals, and optimizing assets in real time for multi-device viewing are just a few of the hurdles that must be overcome to maximize asset value. Download the new Adobe whitepaper to discover the seven trends impacting how digital marketers create, manage, deliver, and optimize their digital assets.